Assay by immunoelectrophoresis resulted in a single precipitin arc against anti-Peroxidase, anti-Rabbit Serum, Armenian Hamster IgG and Armenian Hamster Serum. Armenian Hamster IgG whole molecule. This product was prepared from monospecific antiserum by immunoaffinity chromatography using Armenian Hamster IgG coupled to agarose. Our Abpromise guarantee covers the use of ab5745 in the following tested applications. ELISA 1/25000. This product has been assayed against 1.0 ug of Armenian Hamster IgG in a standard capture ELISA using ABTS (2,2’-azino-bis-[3-ethylbenthiazoline-6-sulfonic acid]) as a substrate for 30 minutes at room temperature. Publishing research using ab5745? Please let us know so that we can cite the reference in this datasheet. Ab5745 staining Armenian hamster IgG by Immunohistochemistry (IHC-P) using the spleen of a healthy C57BL/6J mouse. Tissue was fixed with formalin. Antigen retrieval was by heat mediation in citrate buffer, carried out in a pressure cooker. Tissue sections were blocked with 2.5% goat serum for 2 hours at room temperature, followed by incubation with primary antibody (ab231545 1/100 in 1% BSA) overnight at 4°C. The secondary antibody (1/300 in 1% BSA) was added for 40 min at room temperature. The samples are FFPE. I have tried 1:50, 1:20 and 1:10. I checked the antibody on fresh frozen and it works, so the secondary is all good. The image supplied with the ab shows positive staining on paraffin embedded mouse spleen. I just cannot get our samples working. The application notes say that it works on IHC-Paraffin. What is the recommended retrieval and times for FFPE tissue. Thanks for your message and for kindly providing this further information. I have copied below the IHC-P testing protocol for this antibody, which includes the antigen retrieval details. I hope this will be helpful. Please note this protocol will be a guideline only and may require some individual optimization. 1. Please provide the order number and date of purchase. 2. Time for antigen retrieval with paraffin embedded samples will require some individual optimization depending on the individual experiment (sample type, epitope being detected, species etc). Try different time points to see which provides better results, for example 2, 5, 10 and 20 minutes. 3. TCR gamma /TCR delta is a membrane protein. Therefore permeabilization will not be required. Triton is quite a strong detergent and can disrupt membrane proteins and significantly affect the staining. Try including a more gentle detergent, 0.2% Tween in the wash buffer and antibody dilution buffer. This will help to keep the antibody solubilised and wash away any excess antibody. Make 4-um sections and place on pre-cleaned and charged microscope slides. Heat in a tissue-drying oven for 45 minutes at 60°C. Citrate buffer as per AbCAM recipe. Incubation at different times. From 1hr room temp to Overnight at 4C. All washes 1x TBS as per AbCAM directions. All of the other antibodies that I ordered are working well. I followed AbCAM protocol first. Details that need to be clarified are the antigen retieval in perticular the temps. The protocol is not complete as it says citrate but does not include the temps and times. I don't want to use the little that I have left until the finer details are filled in. 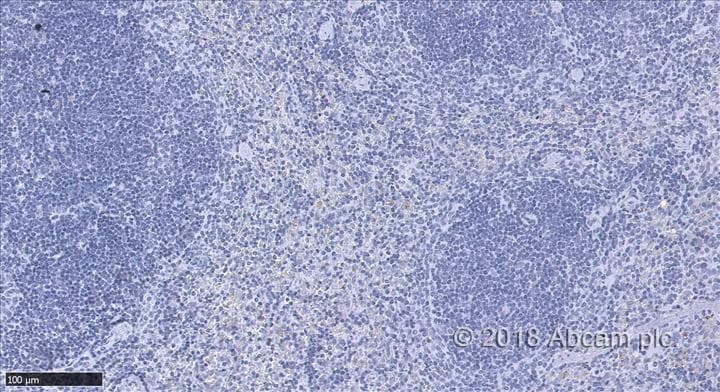 I would like to reassure you that ab118864 is tested and covered by our 6 month guarantee for use in IHC-Fr and mouse samples. In the event that a product is not functioning in the applications cited on the product data sheet, we will be pleased to provide a credit note or free of charge replacement. Although the other antibody has worked well using this procedure, individual antibodies will often require optimization. Protocols are provided as a guideline only and individual optimization will often be required for individual experiments. I would like to offer some suggestions to help optimize the results from ab118864. I would also appreciate if you can confirm some details of the procedure. 2. Fixation: for frozen sections, we would recommend to fix in 4% PFA for 10 minutes only. This should mean that antigen retrieval is then not required. Could you confirm these are frozen samples? There is no mention of paraffin embedding. 3. Antigen retrieval: Antigen retrieval is not usually required for frozen sections. Time for antigen retrieval with paraffin embedded samples will require some individual optimization depending on the individual experiment (sample type, epitope being detected, species etc). Try different time points to see which provides better results, for example 2, 5, 10 and 20 minutes. 4. TCR gamma /TCR delta is a membrane protein. Therefore permeabilization will not be required. Triton is quite a strong detergent and can disrupt membrane proteins and significantly affect the staining. 5. Please confirm what dilutions of primary antibody have been tried? I can suggest to increase the concentration to increase the signal obtained. 6. Is the secondary antibody working well with other primary antibodies? This will help to assess where the problem is.